The role of food in religion goes back as far as religion itself. 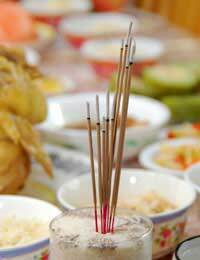 Whether as sacrifice or in symbolism, food has played a major part in religious rites. Hinduism and Buddhism are the major religions followed in India, Thailand and China. Others, including Islam and Christianity, have their followers but we’re going to look at the two major ones along with Sikhism, which is practised predominantly in India and is a little less well-known. Unlike some religions, Buddhism doesn’t have a specific set of rules regarding what can and can’t be eaten. It does, however, have guidelines and principles by which its followers will live, although even then what one Buddhist will eat might not be eaten by another! The first ‘law’ of Buddhism can be read as ‘do not harm’. Many Buddhists take this to be an instruction to follow a vegetarian lifestyle. They certainly wouldn’t kill animals but may eat the flesh as long as the animal wasn’t killed specifically for their benefit. Buddhists also believe that humans can be reincarnated as animals and vice versa; this is another reason for vegetarianism amongst Buddhists. But it’s not just meat. Some Buddhists refrain from eating onion, garlic and leeks as they are said to increase both sexual desire and anger. Buddhists monks and nuns will, of course, be far stricter in their adherence to dietary rules. They rely for their food on alms given to them and at one time they were expected to eat anything that was put into their begging bowl even if it were rotten. Both feast and fast days are part of the Buddhist calendar. Fasting is used as a means of purification and an aid to freeing the mind to allow deep meditation. Buddha himself advised monks to avoid eating ten kinds of meat: elephant, dog, horse, lion, tiger, boar, panther, hyena and snake. Oh, yes, and human! A strict Hindu diet prohibits meat, fish, poultry and eggs. Hindus following the strictest diet also avoid garlic, onions, mushrooms, alcohol, tea and coffee, which all prevent the believer achieving a spiritual high. Although some Hindus will eat meat, they are very unlikely to touch beef. In one of the Hindu epics a character declares that butter is essential to all sacrifices, and it’s also believed that milk and yoghurt can enhance spiritual purity. Thus cows have a vital role to play in Hindu spiritual life. Many Hindus have altars in their homes where food can be offered to God before being eaten. It’s believed that food that is presented as an act of worship, like this, helps purify the believer. There are 18 main feast days in the Hindu calendar as well as those personal ones celebrated by individuals for anniversaries of important family events. A Hindu may also fast for periods during which time he will abstain from certain foods or from all foods. Fasting is thought to help concentration during meditation and worship. There are two particular rules relating to food and drink by which Sikhs have to abide. They are not allowed to eat meat that has been ritually killed (this includes halal and kosher meat) and they must abstain from alcohol, this last to ensure mental and physical fitness. The first rule originates from their belief that ritual killing is wrong as ritual helps neither the animal nor the slayer. The choice of eating meat or abstaining from it is an individual’s; the only requirement for a meat-eater is that it is jhatka meat i.e. meat from an animal that has been killed quickly without suffering. With their religion largely free from culinary rules, many Sikhs have adopted the eating habits of the culture in which they live. The largest proportion of the 25 million Sikhs worldwide live in India, thus some won’t eat beef, some won’t eat pork and yet others will be completely vegetarian. After every service in the gurdwara, a vegetarian meal is served to which all are invited. This langar (meal) is a symbol of the equality of mankind thus meat isn’t served so that no-one will be either offended or left out. This sharing of food is very important to Sikhs and the preparation and serving of the meal is an act of voluntary giving.